With more than 100 brands on the market and an unmatched history, it’s time to celebrate Maryland’s amazing distilling scene. That’s why this November is Maryland’s inaugural Spirits Month. Enjoy special tastings at our distilleries, events and more. Plus, learn to craft unique Maryland-style cocktails with recipes on our website. Follow this link for all the Spirits Month details. Thanksgiving is a time to enjoy friends, family, and—of course—lots of delicious holiday favorites. But don’t feel guilty about a little family feasting, get out and work it off with these turkey trots and Thanksgiving runs across the state. We all know Christmas is just around the corner. Soon, the parking lots will be packed, but if you get ahead of the action, you can plan a Maryland shopping safari and beat the rush. Check out our great outlets and malls, as well as Maryland’s unique, boutique Main Street shopping here. And to give the gift of art, browse the Maryland State Arts Council Artist Registry here. With Maryland's 18 Scenic Byways, you can follow carefully mapped driving routes into areas rich with beauty, history and culture, with plenty to see and do along the way. Themed tours take you through mountain passes once traveled by pioneers in Conestoga wagons; follow city streets in grand and fashionable Central Maryland cities; incorporate some of the most interesting neighborhoods bordering our nation's capital; wind along country roads in Southern Maryland; and urge you to make new discoveries on the peaceful shores of the Chesapeake Bay. So relax, take your time and enjoy the many wonders that await you along Maryland's Scenic Byways. There’s no time like the holidays in Maryland with Thanksgiving parades, train gardens, Christmas lights, seasonal concerts, performances, and that warm Maryland welcome. Don’t miss annual favorites like Gaylord National Harbor’s ICE! extravaganza and Six Flags America's Holiday in the Park. 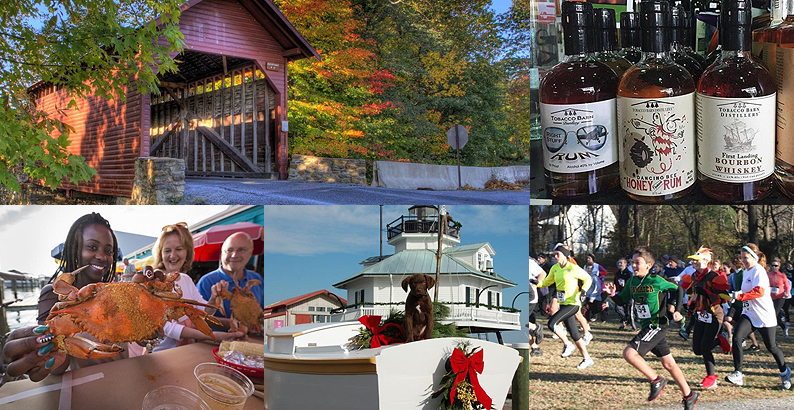 Find all this and much more at our Holiday Happenings roundup page. November is the perfect month for Maryland seafood. Rockfish are running, the crabs are the fattest of the year, and both wild-caught and farmed oysters are on the menu. So why not get out and explore our delicious seafood landscape? Whether it’s steamed crabs hot out of the pot, or pan-seared rockfish in a delicate oyster cream sauce, your perfect meal is out there. Follow this link to our Crab & Oyster Trail and crack, shuck and savor the flavor of Maryland. Enter to Win on Maryland Mondays! Don’t miss your chance at free tickets for amazing events across the state. Every Monday on Instagram, Facebook and Twitter, the Maryland Office of Tourism is joining with our sponsors to give away great Maryland travel experiences. We call them Maryland Mondays, but you can enter all week. This week, you’ve got two chances to win as we give away tickets to Bennett’s Curse Krampus Haunted Christmas and ICE! at the Gaylord National Harbor. Follow us on Instagram, Facebook, and Twitter to enter.